No more Ramadan posts for the year, as I am currently away this week - in the Midwest USA. Had a long grueling flight here....imagine sitting down for almost 24 hours and 4 planes! It is good to be back in the USA, I just realised when I did my visa application, it has been 8 long years since I last visited in Dallas, Texas. Since it is mainly a work trip, that gets priority first. However we get the evenings off, so there is some flexibility to search for food. I plan to start blogging on old entries this week, as I still have Internet connection all the way. Uploaded the pictures before I left, hopefully no technical difficulties. Apologies on not posting for a week - been very busy running around getting paperwork done. I finally had time to relax during the weekend and catch a Ramadan Bazaar yesterday! 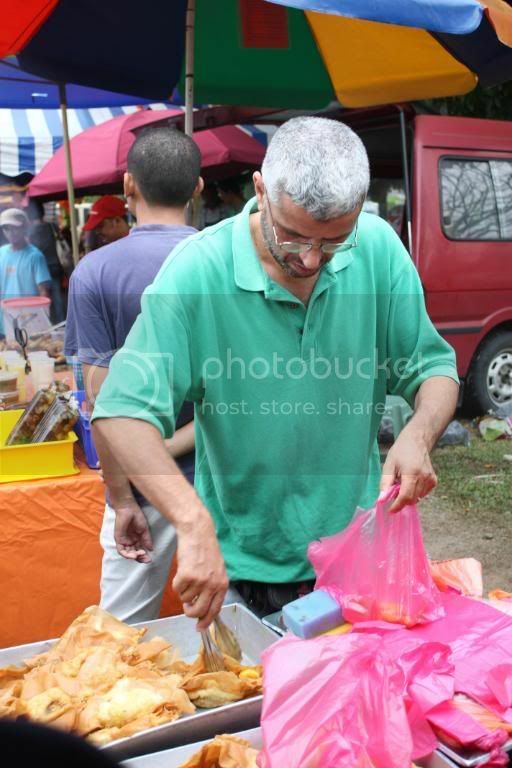 Initially I wanted to go to Taman Tun Dr Ismail's bazaar, since it was on the way back from 1 Utama. I suddenly remembered it would be a disaster if I went there, since the bazaar coincides with the usual Sunday night market. Luckily we didn't go as I saw loads of cars. 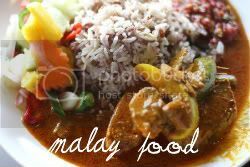 Next was Bangsar, since we went grocery shopping at Village Grocer but we decided to give it a miss since we covered that. I wanted to go and try the bazaar at Pantai but Splashie Boy insisted on visiting the one at SS18, Subang Jaya. Am very glad we did pop here, as I had the most fun here. The bazaar here definitely ranks as one of the most unusual bazaars in town. What is so unusual about this place? It still has the usual satay fellas - one doing an all beef version and another stall selling chicken. Both looked irrestible, hence I snapped both their pictures. Notice how white the charcoal is, indicating a very hot fire. or you prefer chicken instead? Fire definitely caught my eye at this bazaar. 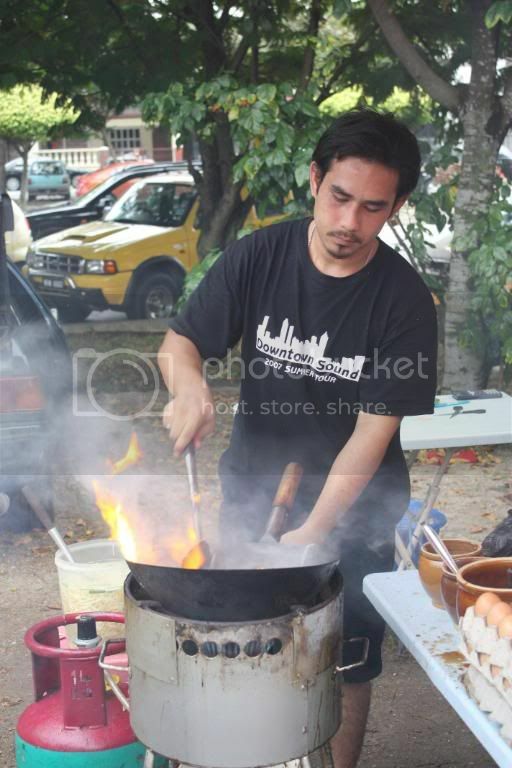 First, it was a fella frying kuey teow in a wok. Flames licked the wok from the side, and they seem to dance higher whenever he threw in his ingredients. Not sure if it tasted good, but he got good patronage from his customers who didn't mind waiting for their noodles. how high you want the flame ah?? Next was this enterprising chap who called me over to his stall and asked me to check out the stall next to him. He told me, there was live fish inside the fish curry - a big fat white lie of course, but it did catch my attention. 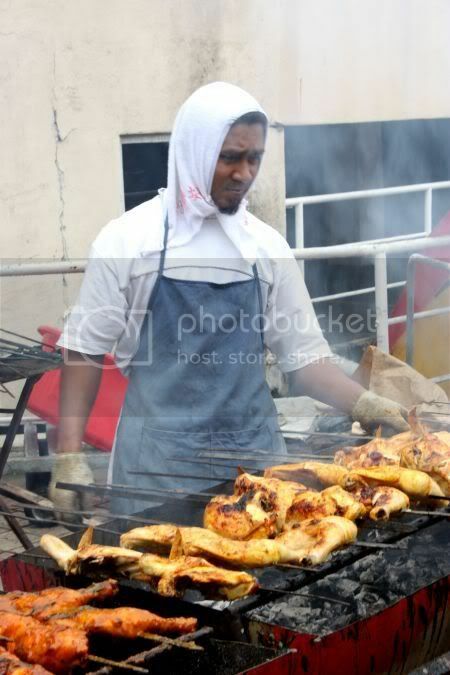 I liked his grill - using a gas version which had tiny flames dotting the length of a pipe. Cleaner than charcoal but I guess the taste will be different. 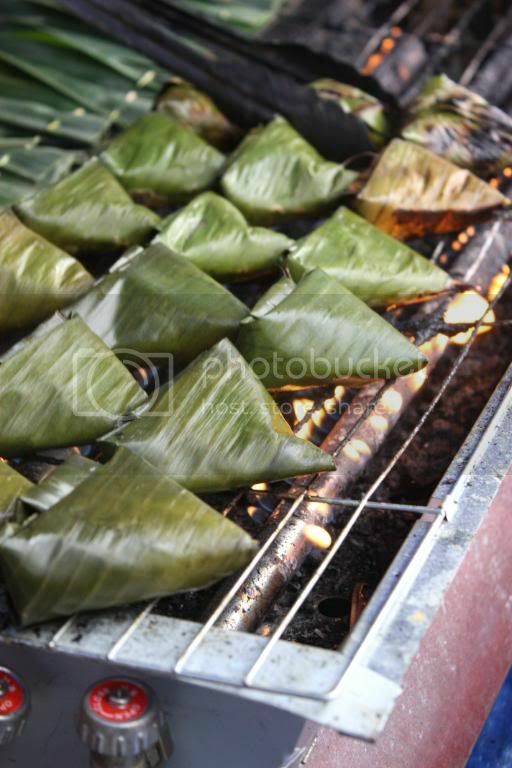 According to him, he adapted the gas burner to suit his grilling of pulut panggang and satar. 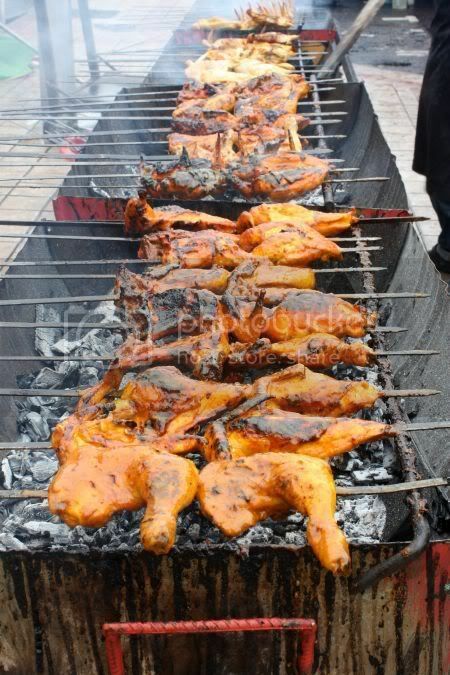 I did see another stall using this type of grill, but it was an interesting idea. One stall amazed me...they were using this old Butterfly brand oven with a charcoal grill. 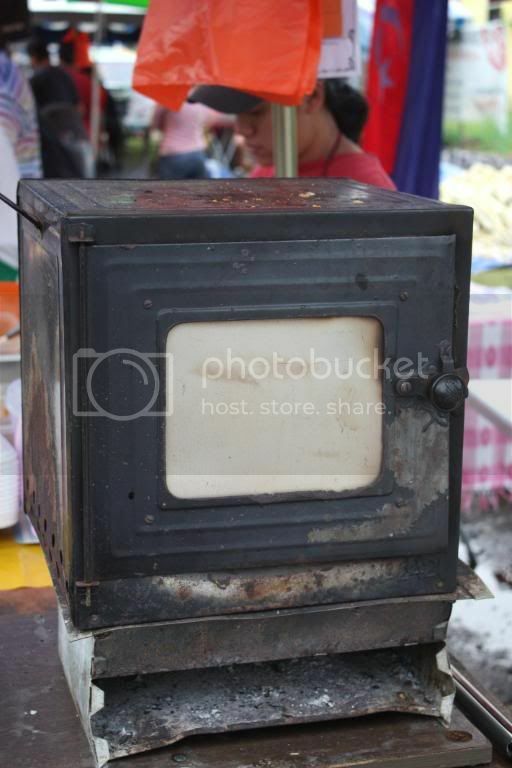 Per Splashie Boy, these ovens are antiques and usually found in antique shops. This fella was putting the oven to good use - roasting potatoes inside it. They looked delish - would have gotten some for dinner but I had plans to roast a leg of lamb. 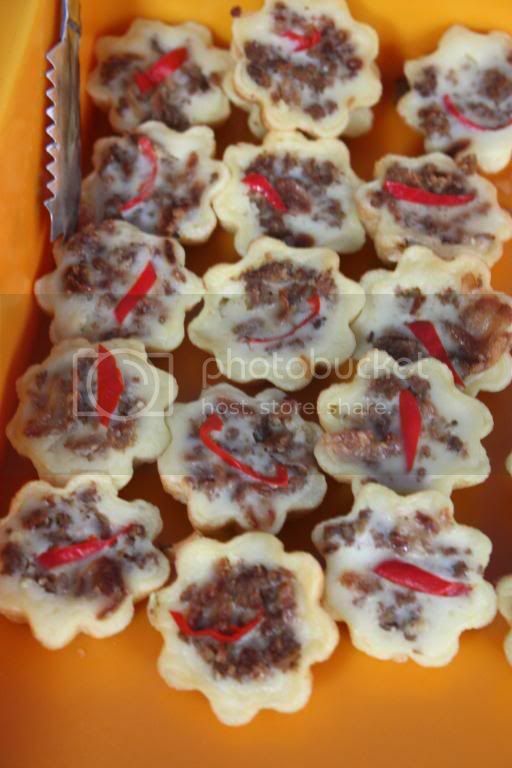 There's minced chicken and minced beef toppings with cheese. One of the best things of visiting these bazaars - they have the regular stalls you know you have to try every year. We spied the sotong bakar fella around - very aromatic and a smell to tempt you when the sotong pieces are on the hot charcoal fire. Last year I thought, the Tunisian stall is no longer doing business, hence I was so happy to see the fella manning his stall this year. 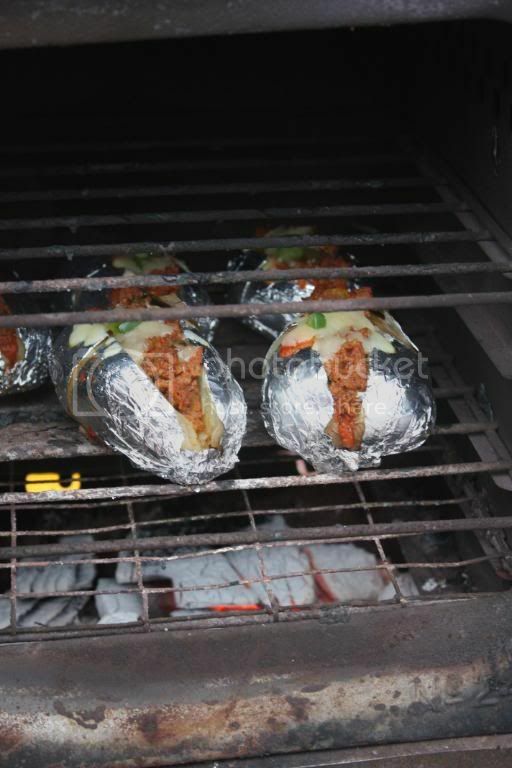 The briq tasted just as good - stuffed with chicken and an egg. Worth queueing up for the delish snack. You guys should drop by and try it. Another regular here - the lauk stall. The tables are groaning with the huge metal platters of food. 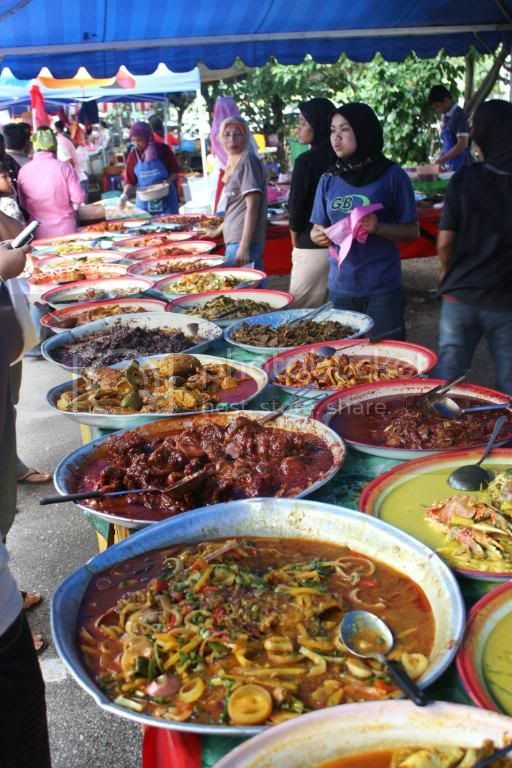 Everything looks so delish, one often have trouble choosing the dish you want. 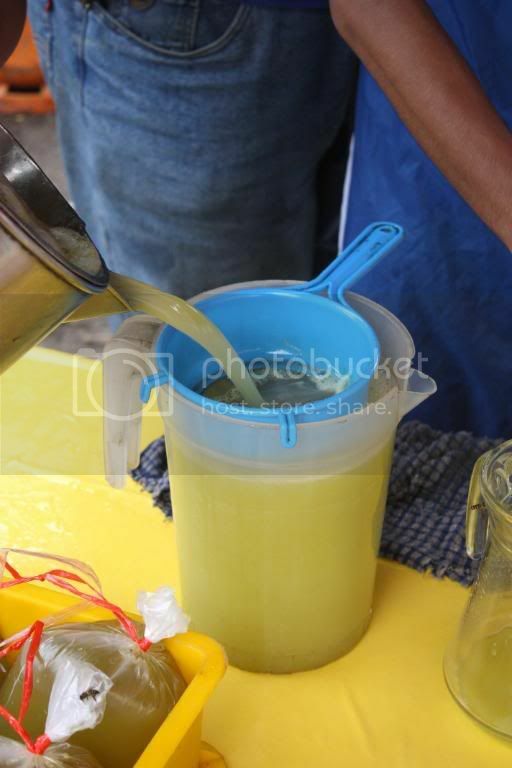 This bazaar seems to have the most stalls selling sugar cane juice. If you prefer other naturally sweet drinks - they also have fresh coconut juice. Everyone seems to prefer it to the colourful drinks made from cordials. And if you love going for the unusual, try this non-alcoholic malt drink from Dubai. 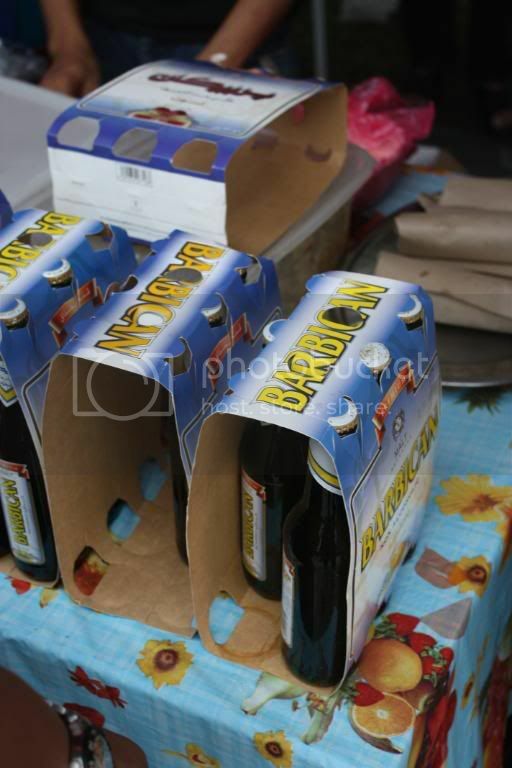 These Arabic looking fellas were doing brisk business selling these bottles. We bought 2 to try - am drinking the lemon flavoured one now. Tastes quite nice but of course, no alcoholic taste at all. Kinda like drinking shandy. 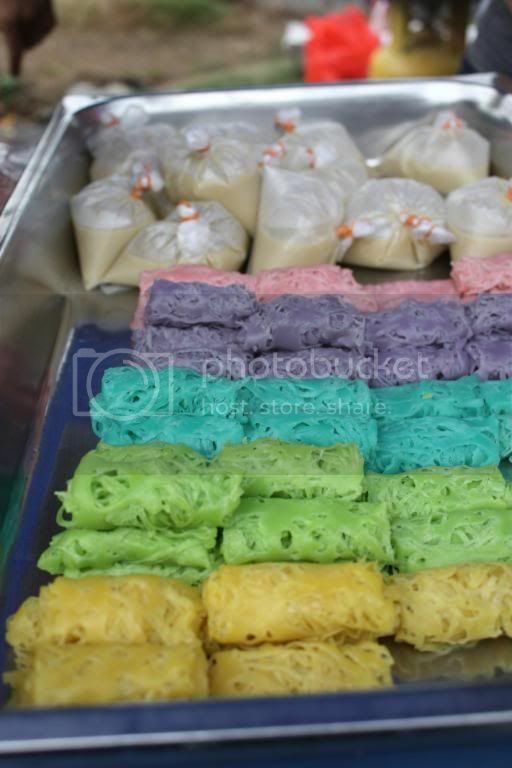 This bazaar has unusual stuff - like these colourful roti jala. I only snapped a picture but looking at the gravy at the back of the roti jala, I reckon this could be the durian version. Looks nice and soft - the type I prefer. 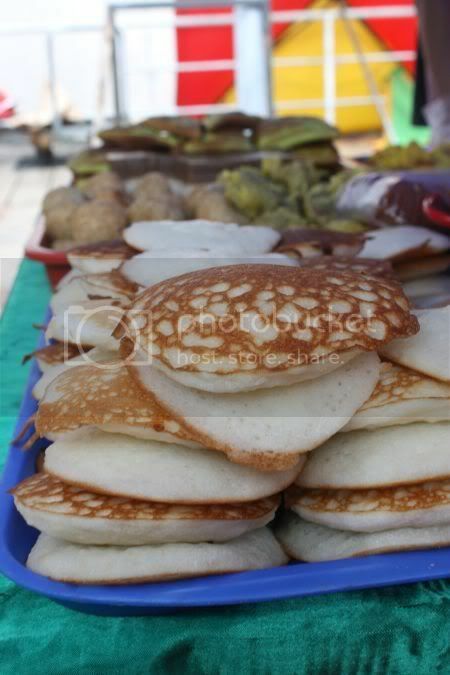 I liked this one - the roti mat salai. 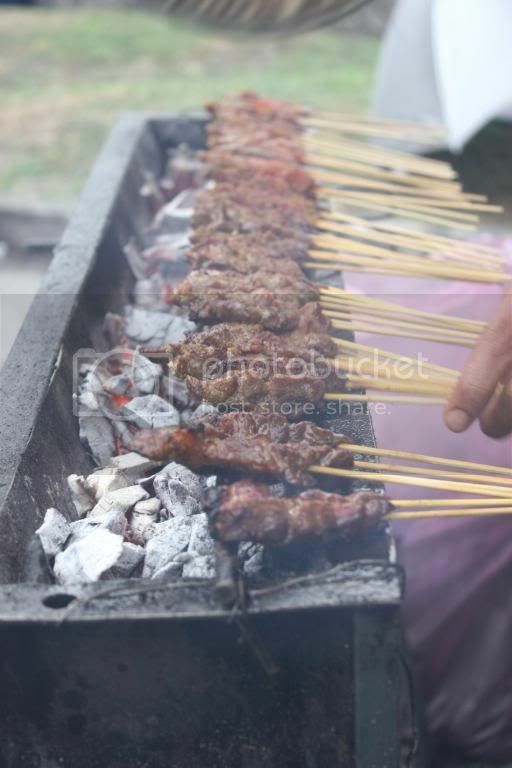 Very similar to the Chinese version found in pasar malam, this one is halal, as beef is used and grilled. Looks simply delish. 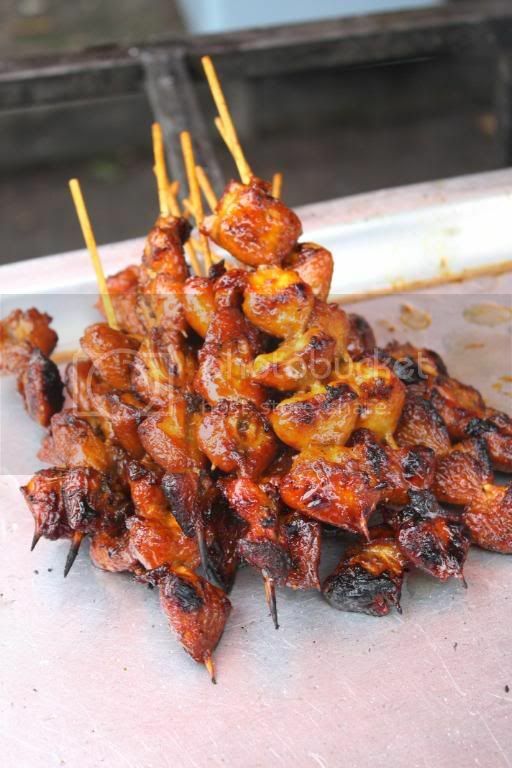 Also spied this vendor selling chicken butts grilled till honey brown that looked delish. One stall owner, couldn't cope with the attention of his customers. Everyone seems to crowd around this particular fella and he sells the unusual pulut (glutinous rice) steamed in banana leaves and dipped in fresh grated coconut. 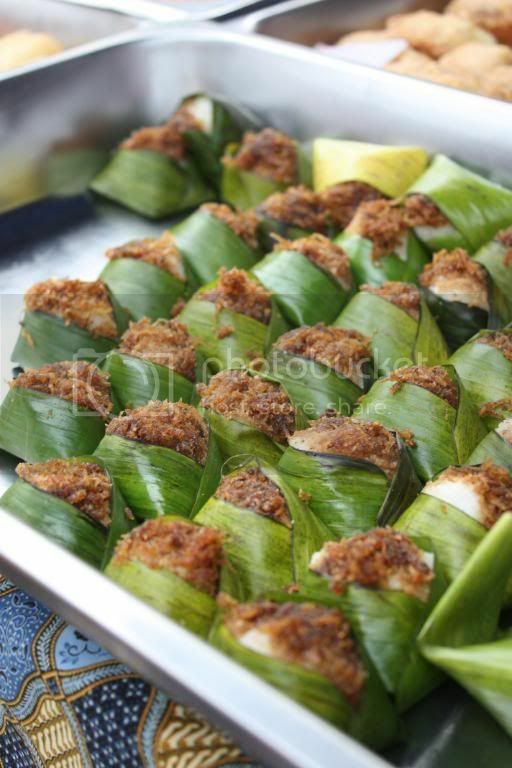 The kuih is served with gula melaka syrup for flavour. 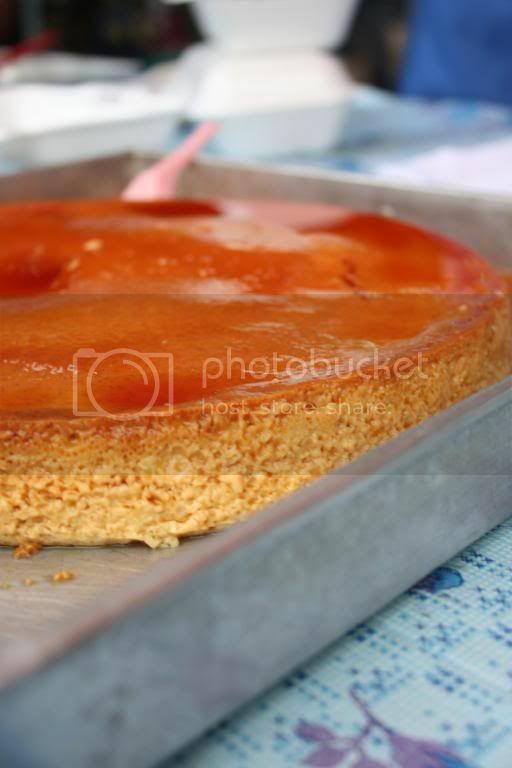 For both of us, a must is the creme caramel. 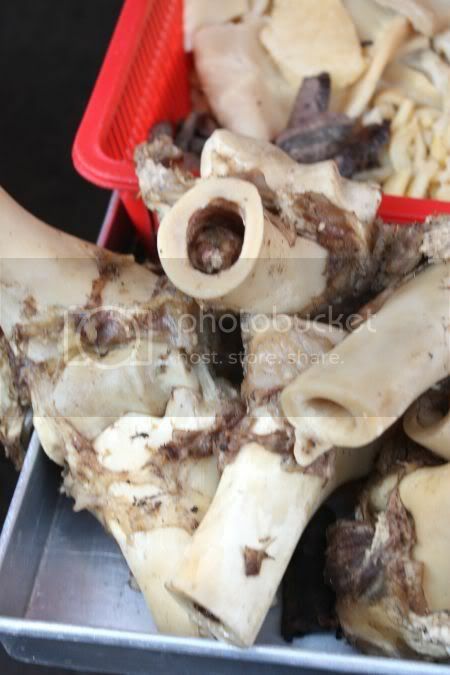 A lot of stalls sell these big versions, which they slice them up. This particular stall run by an Indian fella sells very delish creme caramel - smooth and not overly sweet. Hope you like the pictures - I decided to upload more so I can make up for the lack of posts last week. For more information on the bazaar, click on the 2006 entry. We had a nice lazy weekend...celebrating Mid-Autumn festival and even managed to squeeze in a visit to the Ramadan Bazaar, just before it started to pour. 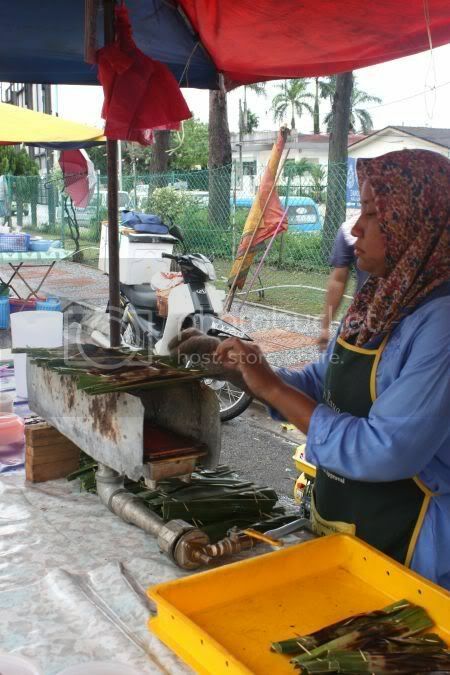 One of my ever favourite places is Section 14's Ramadan Bazaar as you get one of the best popiah basah in town. 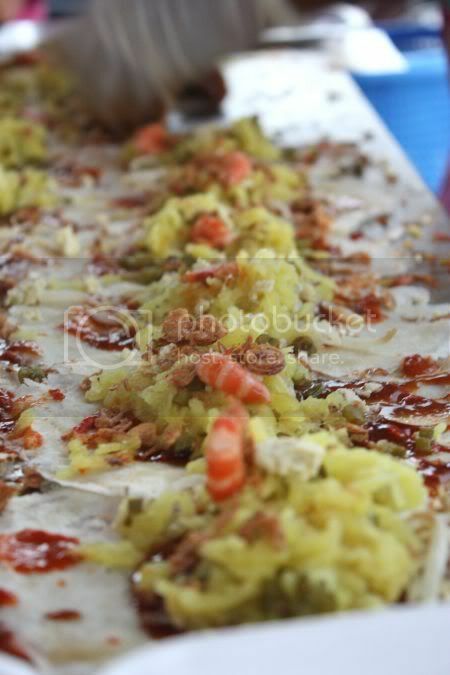 It is so good that you must queue ages, as there is so much demand for the popiah. This year, I decided to stand there and watch them do the whole wrapping sequence. I even managed to capture it, so see my flickr set for Section 14. 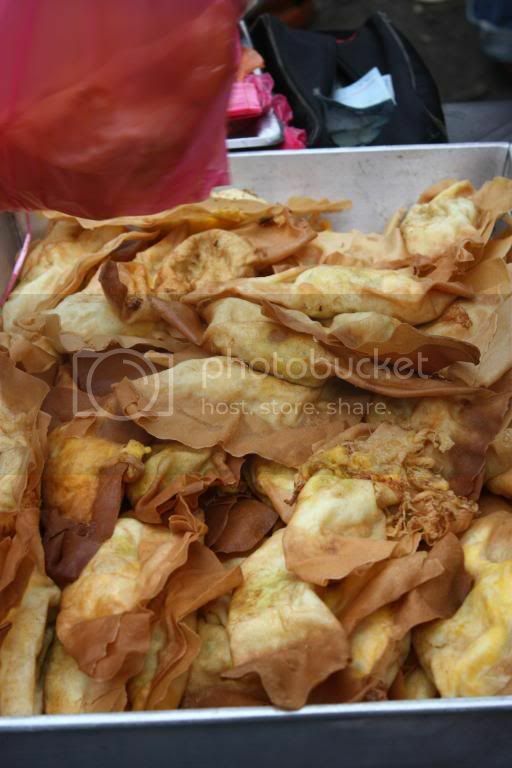 I love watching how they wrap these popiah....first place all the skins in rows, then add two types of sauces - the sweet one and then the spicy one. Then sprinkle the bean sprouts, the cabbage and the chopped egg. 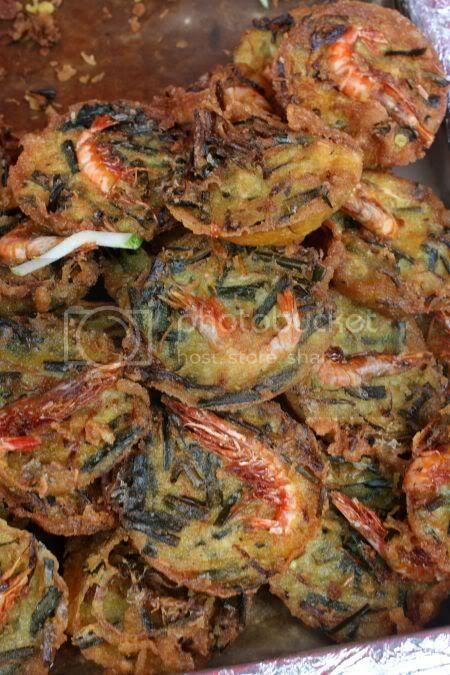 Sprinkle a prawn and fried shallots. Once everything is assembled, wrap it up and place in containers for people to take home... 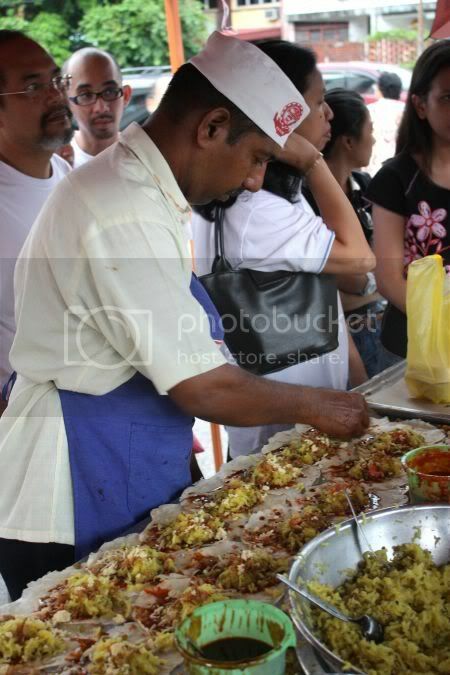 Very different from Popiah SS Ali in Shah Alam, as instead of making sure each popiah gets an equal amount of toppings, they tend to push the popiah fillings downwards, whenever they wrap. I reckon it could be due to the lack of space they have to spread the popiah skins but at least here, there is a proper control of ingredients. While, I was snapping away, someone came over and asked if I had a blog since I obviously wasn't a professional camera person from a publication (kinda obvious since I use such a puny camera versus those ultra canggih ones). She was amused to find out who I was and she even ended up at the bazaar because she read my posts! Cool! Am glad the bazaar posts seem to be getting to people to try out these places. I was even more surprised to see even Hannah Tan had her Ramadan Bazaar posting during the weekend. Positively made all the guys drool as she was eating a kuih keria. Even though we got there quite early, there was quite a crowd rushing around to buy food. Luckily we got a parking space nearby even though we had a little trouble getting out, as people were double parking everywhere. I spied all those familiar people, at the beginning of the road and around the field. New ones were the roast lamb chap. 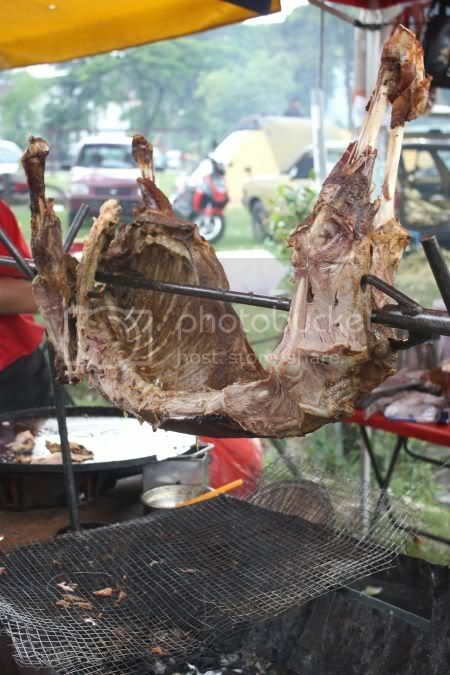 This time, one whole lamb was being cooked. Also saw them cooking pieces of it on a hot plate. What else we spied? 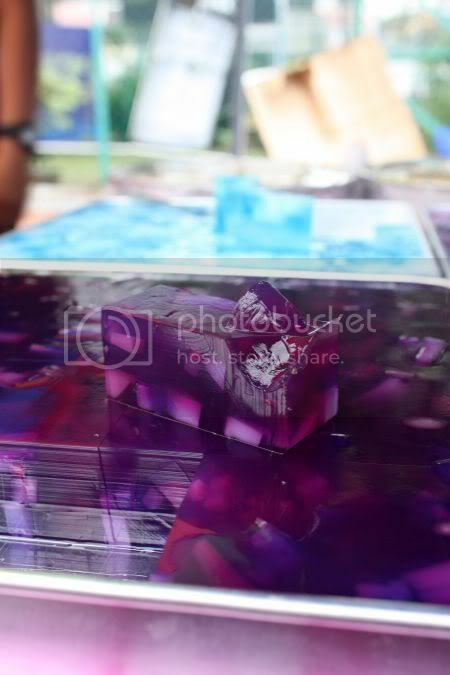 There was this interesting recycling campaign going on also - recycle the tetra-pak containers. Seems if you give in a few containers, they give you back shopping vouchers in return. Kinda good initiative to start everyone recycling. 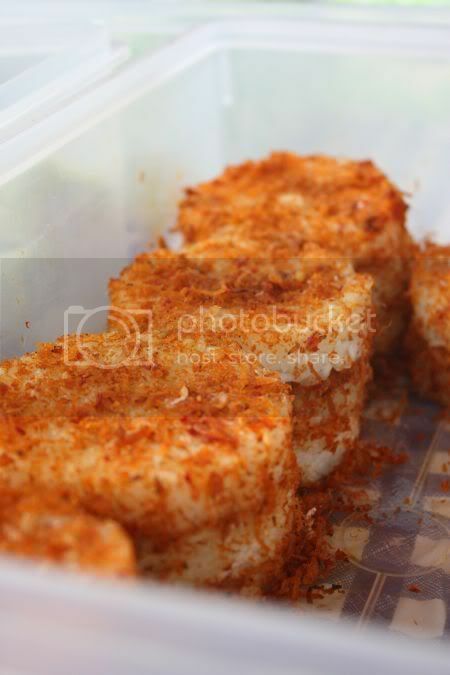 I wanted to look for my favourite putu piring stall - the one I have eaten since very long ago. 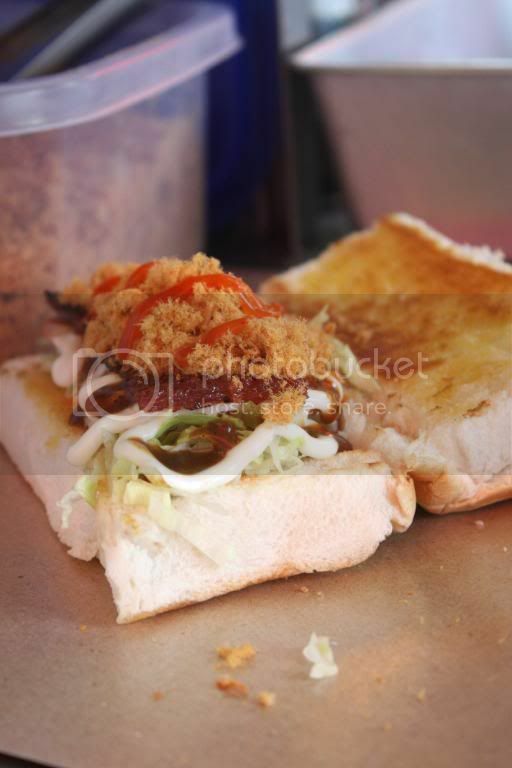 That couple now has a permanent stall in USJ2 and one at Section 17's pasar malam. Sadly they were not around but we did find one stall. Tried to queue up for it, but gave up as the rain started pouring down. Another plus point about eating here, is the seafood choices here. 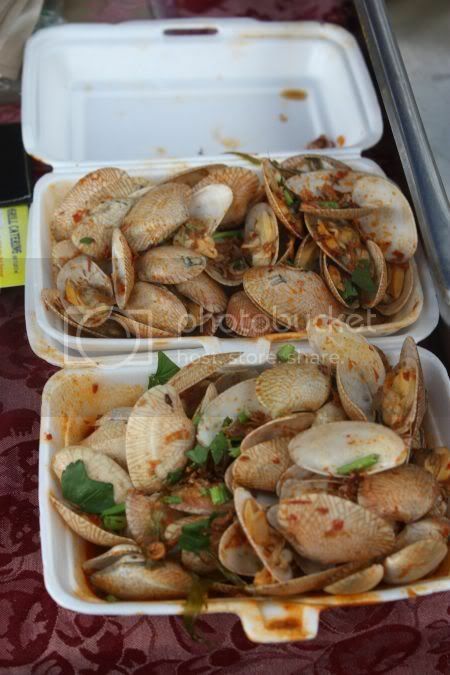 There's the famous Gerai Sri Melaka, nearer to the field and the first stall selling clams and all kinds of seafood. This year, there is a new stall selling the portugese version - wrapped in foil and cooked on a hot grill. 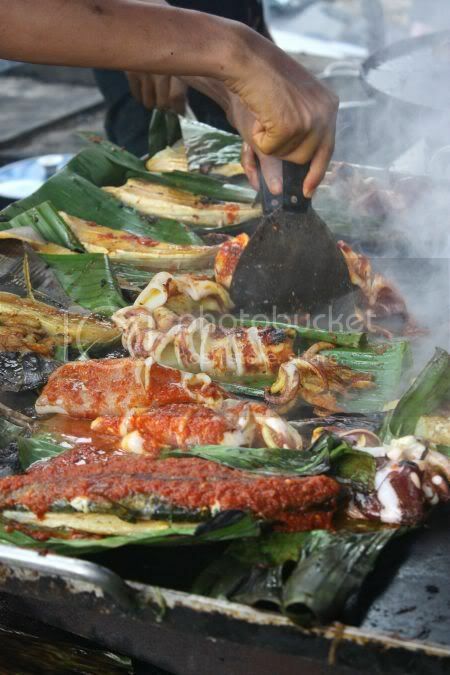 Somehow people seem to prefer the old type - cooked over banana leaf and slathered with loads of sambal. 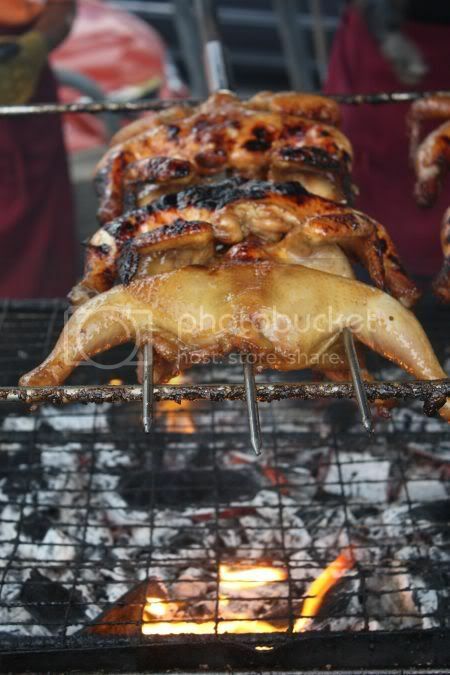 Everything looked good - down to the chickens being roasted over a hot charcoal fire, the satay stall next to it and the stall selling pulut panggang. 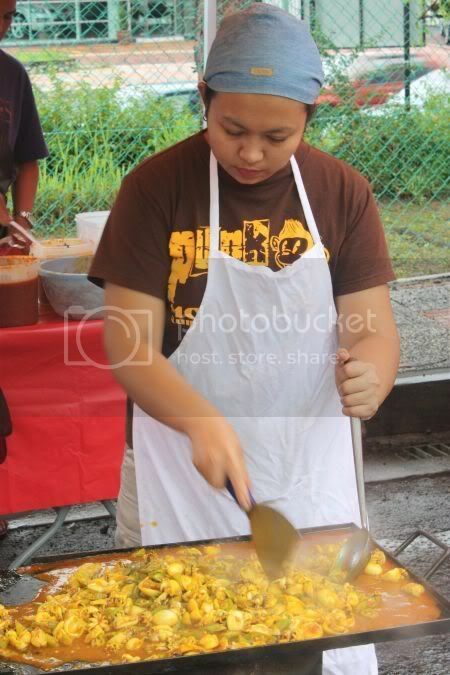 I loved those stalls selling all the curries - Minang style and the nasi ulam one with the bubur manis. Had to resist buying from them, as I know I won't be able to finish everything. 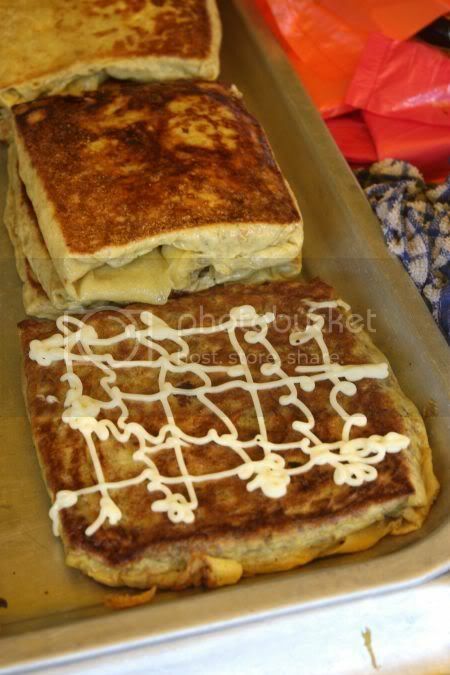 Murtabak or roti john are good choices, if you want a simple meal since it's packed with loads of minced meat. 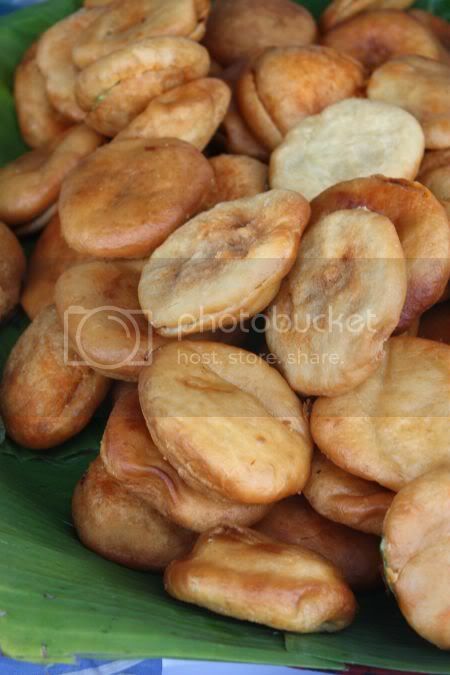 One lady was selling the ultra rich and sweet Kelantan kuih - jala emas and nekbat that looks like teardrops. Made from duck eggs, they are very sweet (soaked in syrup). Not many places seem to sell this though. First place I have seen with these kuih, this year. The deep fried buns filled with sambal seem to be very popular here, spied a few stalls selling in. One even had a huge stack of it. 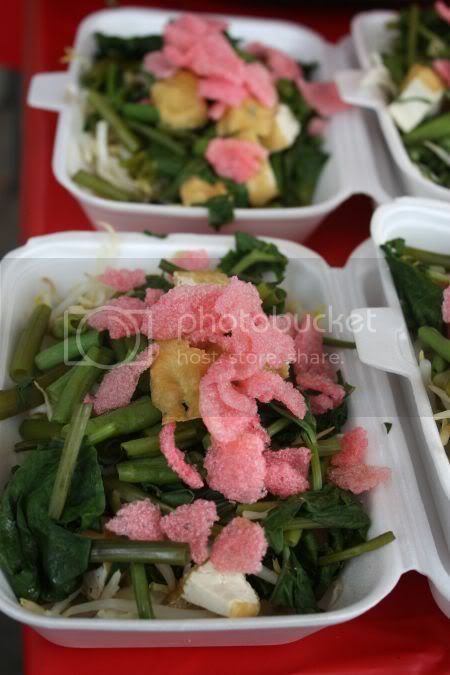 Somewhere down the field, I found this stall selling pecal or gado-gado. What attracted me was the pink coloured crackers they had on top. Very striking! For more pictures from previous years, click on 2007's entry. Apologies for the late posting.....been kinda busy again, as I needed to sort out my car this week. A quick note, that I forgot to post up on Monday, Godiva Chocolates has opened their outlet in Suria KLCC. We saw them opening their doors on Sunday and frantically getting everything ready. The store, in front of the escalators and next to California Pizza Kitchen, is not very big - watch out for the high step at the entrance, I almost tripped when I walked in. There are packed chocolates, chocolate truffles you can select and chocolate drinks to take away. While everything looks good, be prepared to dig deep into your wallets, as stuff here is pricey (we reckon even a chocolate bar is about RM20 and the chocolate blended drinks is RM22). I kinda suspect chocolates will be cheaper if you buy them in KLIA but since I don't regularly buy chocolates, I can't really confirm the prices. Back to today's post - a change from the Ramadan Bazaars to appease the other fans. 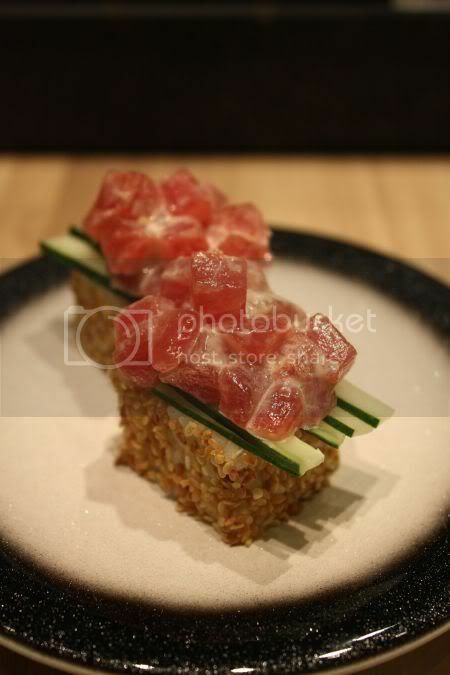 I decided to visit the latest place for Japanese fare in Sunway Pyramid after reading about this place from ling239,. The place is nicely decorated in cool black, bronze crane figures (seems Senjyu is Japanese for crane), green bottles and bronze covered chairs. Part of the same group in Singapore who owns Sakae Sushi, this outlet was previously Genki Sushi. The holding company of Sakae Sushi, bought all the Genki Sushi outlets when the franchise holder in Kuala Lumpur decided not to renew the franchise agreement. While the outlets in 1 Utama and Suria KLCC have been changed to Sakae Sushi, only this place sports a new concept and name. While this place still sports a conveyor belt, looking at the menu offerings and prices, you know they are trying to go upmarket. I reckon, they kept the conveyor belt because, it was already fitted in. The outlet just opened in August 2008 and another outlet is set to open at Cathay Cineleisure, Damansara in mid-September. Seems the concept will be similar in the new place, and they will also offer yakitori (grilled food on skewers) there. I had a fun time trying the items here, but they are definitely not cheap. Most expensive item on the menu is RM129 - for a special type of sushi served with shabu shabu. The conveyor belt, does not really have a lot of items and prices range from RM4 to RM16. Items like the plain cucumber maki are RM4, while RM6 will get you the salmon sushi (with the longish tail) and tuna topped makis. Some offerings are pretty unique - for instance, instead of a short piece of cut fish covering the sushi rice, here they offer a long piece of fish (about double the size) that can wrap round the rice. While this means more fish to eat, one thing they forget when they designed this unique fish roll is the practical side of it. 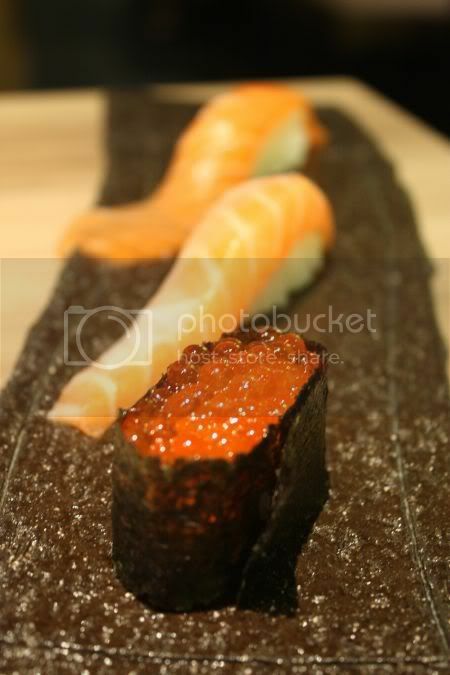 The roll ends up being a little too big, to fit in the tiny soy sauce plate, when you want to dip it in. Instead, you have to carefully fold the fish round the sushi rice to eat it. I found the high end items, especially those items you order from the menu pretty good. 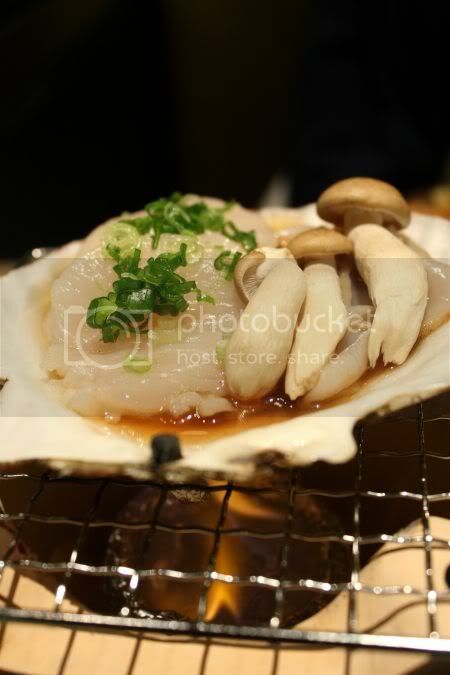 My favourite was the giant hotate (scallop), you cook yourself on a grill with mushrooms. Very fresh and sweet! 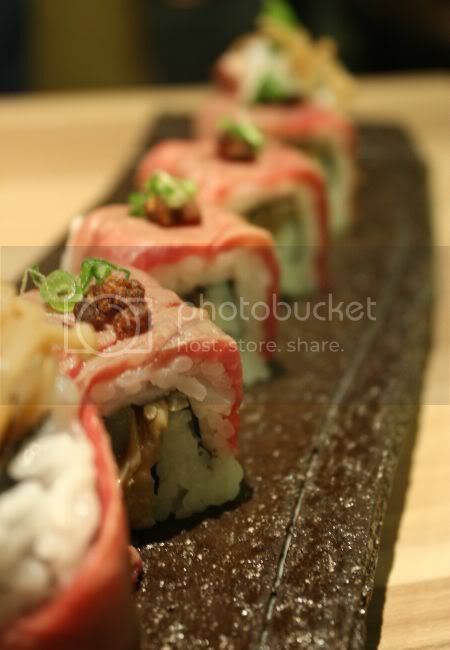 There are also a lot of maki choices (about 20 varieties) - wagyu beef slices wrapped rice with asparagus that Splashie Boy loved. They also had a luxe oyster and foie gras maki with cod roe. 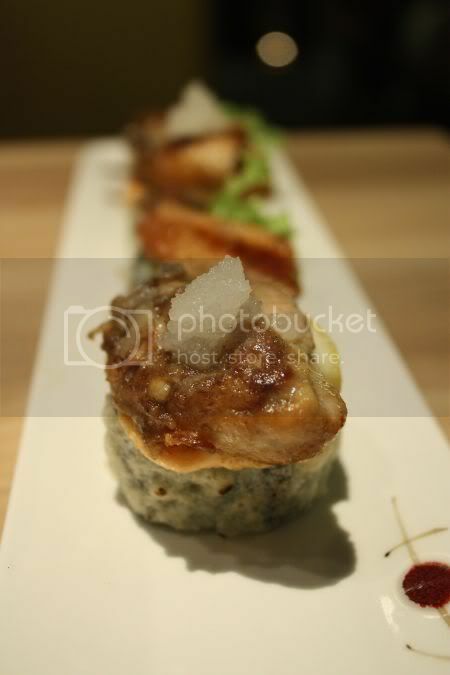 While the oyster maki was very nice, as it was topped with a large juicy oyster, the foie gras maki was kinda sad, as they give really thin slices. So thin, you don't get that melt in the mouth texture from foie gras. 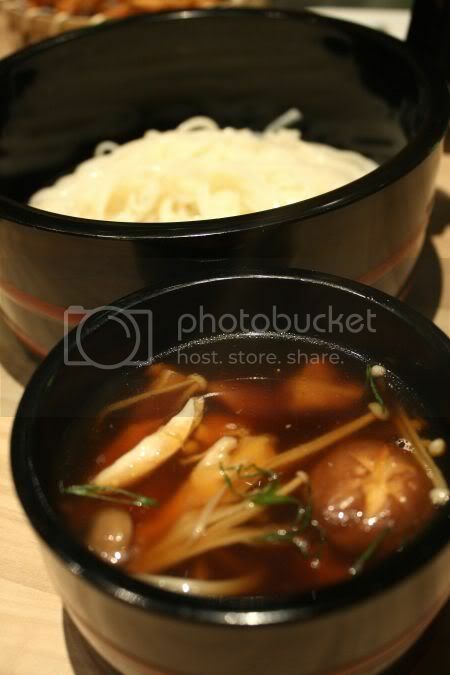 Another interesting item they have is charcoal udon, that is dipped in soy sauce. We didn't try that but went for the inaiwa udon instead - silky white cold noodles with a broth filled with mushrooms and chicken pieces. While, I loved the high end items and would not mind returning for the makis......this place is definitely not for those on a budget. 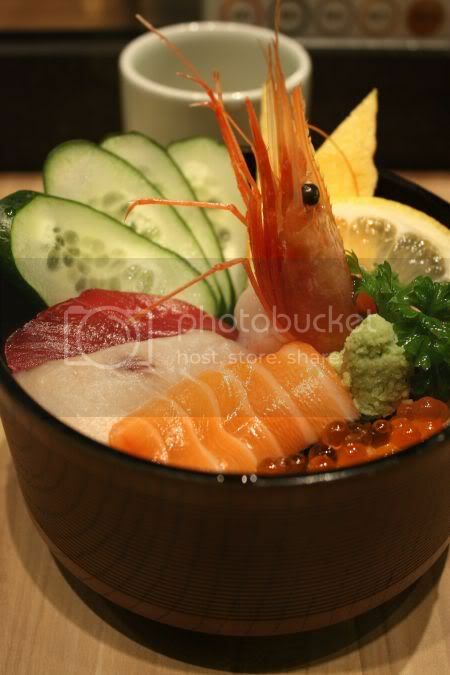 For instance, the chirashi sushi is miniscule. Hope you can see from the picture, how small it is as I placed the green tea cup next to it to show all of you. It was kinda small and the sashimi slices given were really thin. I fared better with the conveyor belt choice - a sushi topped with chopped tuna mixed with mayonnaise, that was pretty good since they coated the sides with sesame seeds. Another plus point about this place is the service here - very impeccable especially if you get the lady manager. She painstakingly explains things on the menu and asks if everything is okay without being too nosy. Hence, I won't mind returning back for the food again BUT I reckon, I'll just order from the menu the more unusual items, as the usual items like chirashi sushi aren't really worth it. Also another word of caution, try and visit them on Tuesday and Friday, as that is when the fish is the freshest since shipment comes in those days from Japan. I made the mistake of dining here on a Monday, and believe me the fish wasn't so fresh compared to my other visit here. For more pictures, click on my Flickr set. This year, we don't seem to be adventurous - sticking to the old places like this one in Bangsar purely because we went grocery shopping at Village Grocer. We were kinda lucky, as we caught the bazaar in between the constant rain fall during that day. Honestly, we're beginning to resemble the dull and dreary British weather. It's never hard to spot a bazaar anywhere, just sniff the air and follow the smoke plumes. 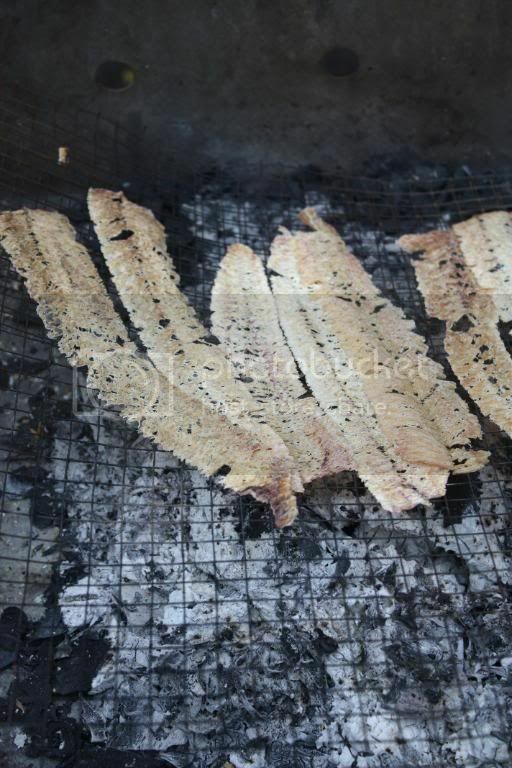 Usually it is the ayam percik guys who rustle up the most smoke with the ikan bakar fellas running next in line. It's definitely a very "hot" business, and sometimes, you will do anything to keep cool - even though you drape yourself with Good Morning towels. 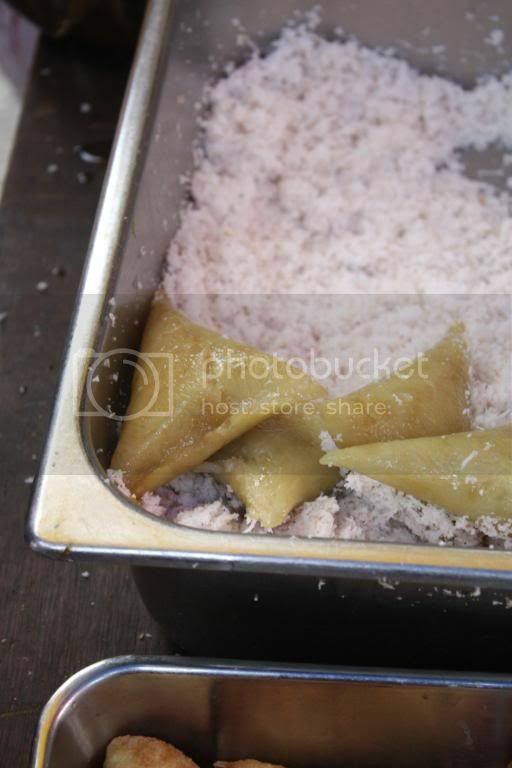 Kuih stalls are the first thing, people make a beeline for and usually the first to finish. 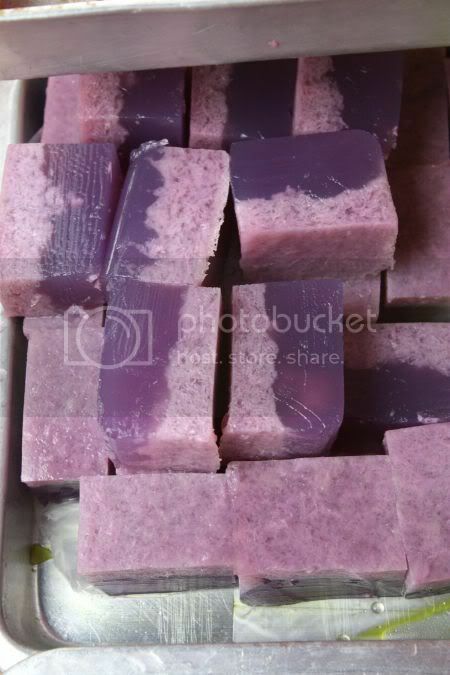 I spied the bright electric blue kuih dadar here again - didn't snap a picture since I took it one year and this unusual coconut milk rich apam. The usual suspects were also here - onde onde, kuih seri ayu, doughnuts and etc. 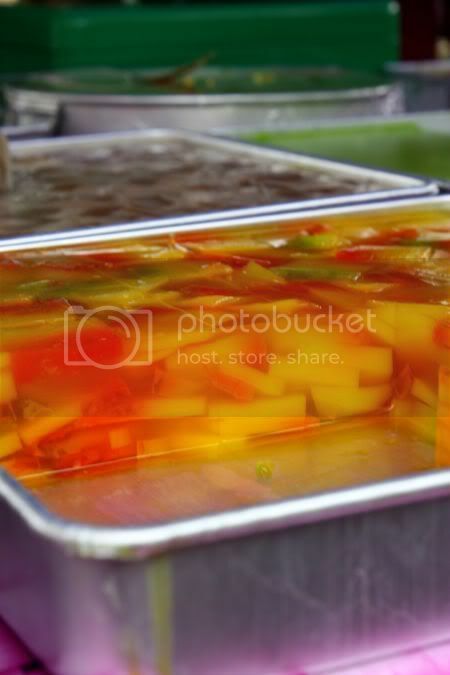 While some love those kuih, I absolutely love cool agar-agars. 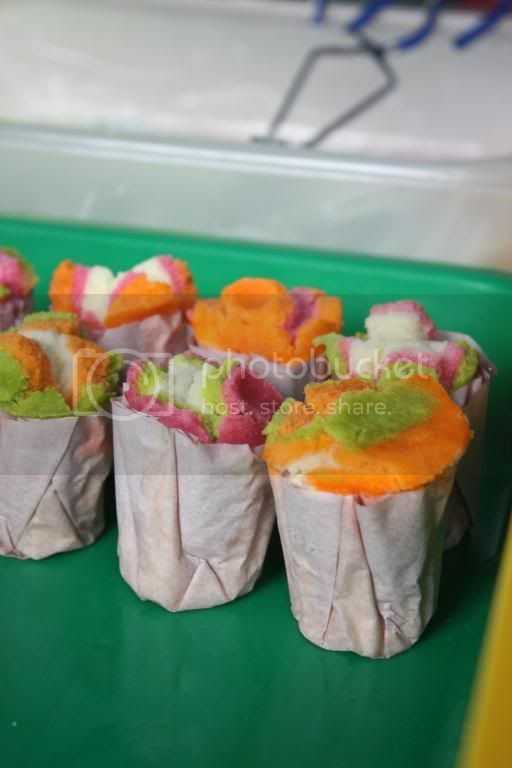 Set out in metal trays with a rainbow of colours, they also come in various flavours like Sarsi, banana and etc. I love the details some stall owners do - coordinating the various colours, like this orange and reddish one. Or, like this version in deep purple - must be a blackcurrant version or the pale blue version. 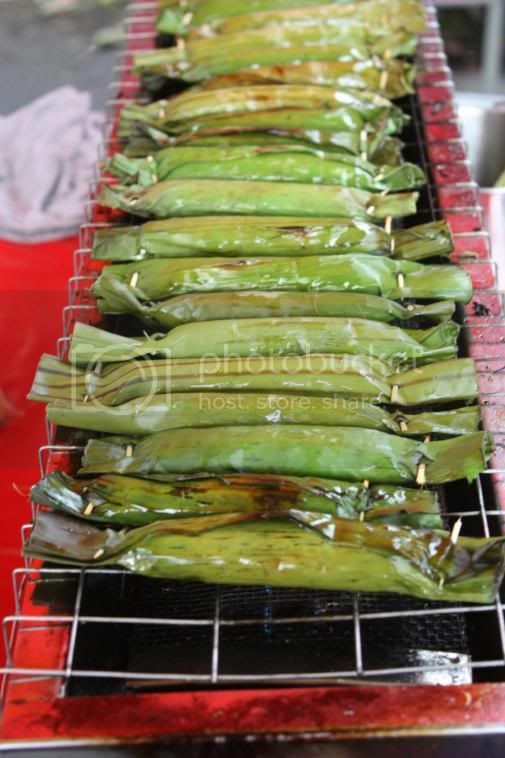 While most of the stalls were selling kinda ho-hum items - this particular one had an unsual contraption to barbeque the wrapped otak-otak. I reckon it is home made and it looks extremely sturdy. 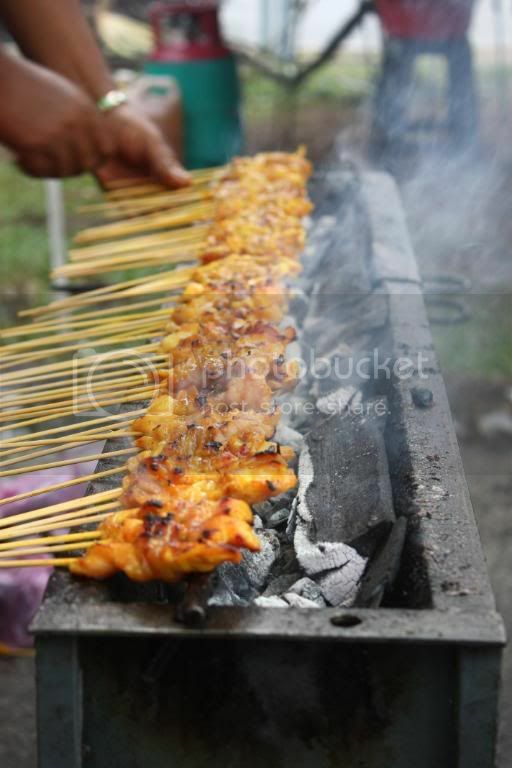 Saw one fella making satay on a make-shift camp stool....looked really flimsy and about to collapse, and kinda weird since it was so low. Murtabak Din seems to be spreading their wings here, with a stall. They claim to be the king of murtabaks. I wonder if it tastes as nice??? The old regulars were hanging around - the people who fry up the seafood and foil packets of fish or seafood, Portugese style. 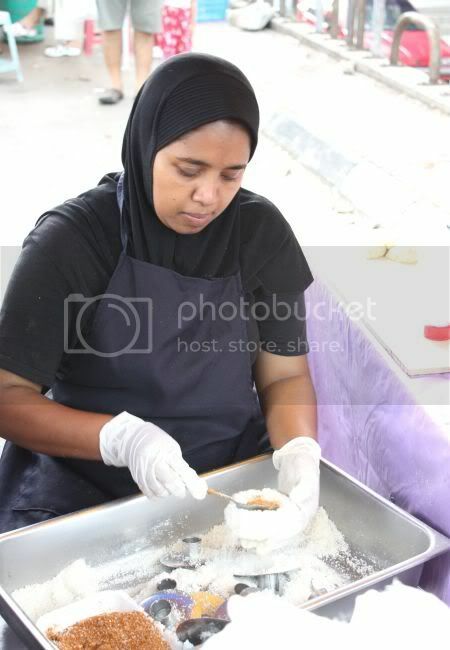 Even the auntie who sells kuih jongkong was there. 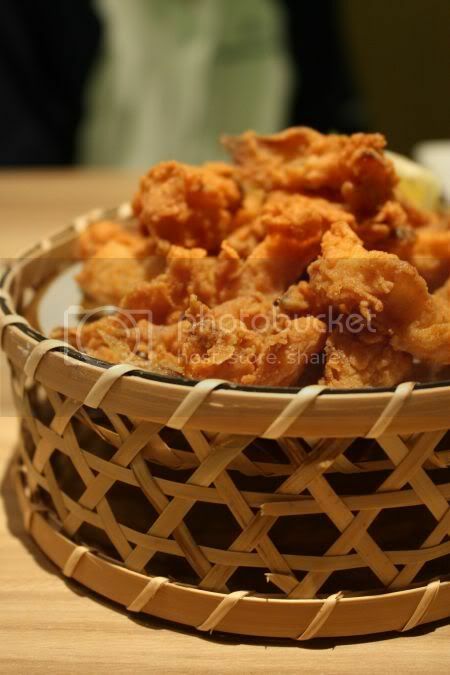 Two versions of this fried prawns - the cucur udang version pictured above and also another version at the Rojak Singapura stall. 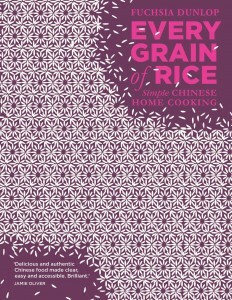 That one was plainer, without any chopped chives. 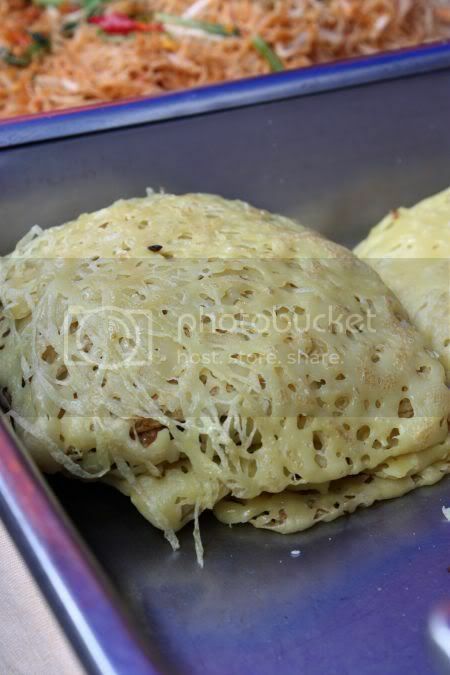 this year, the roti jala fusion item has a new name...."rojabak"
Bangsar is well known for one item, they seem to have come up with - the roti jala fused with murtabak. 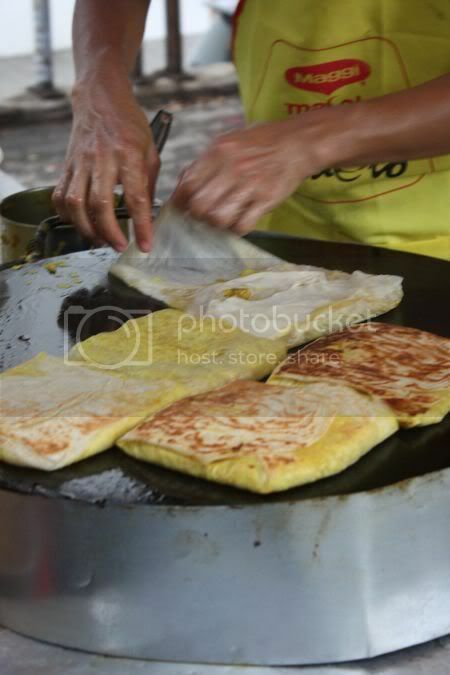 Seems it is now known as rojabak - ro for roti, ja for jala and bak from murtabak. The original people who came up with this idea is Sarawak Cafe. 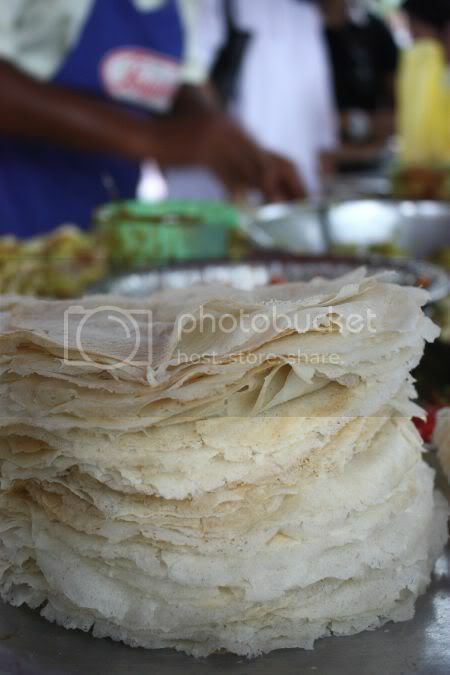 The nice man at the stall even showed me the step-by-step to make this unusual item - first make a bigger roti jala, then dab planta margarine on top and flip. 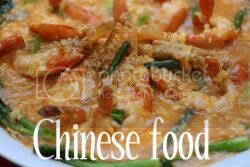 A ready made filling - egg with minced meat and vegetables, would have been fried ahead. 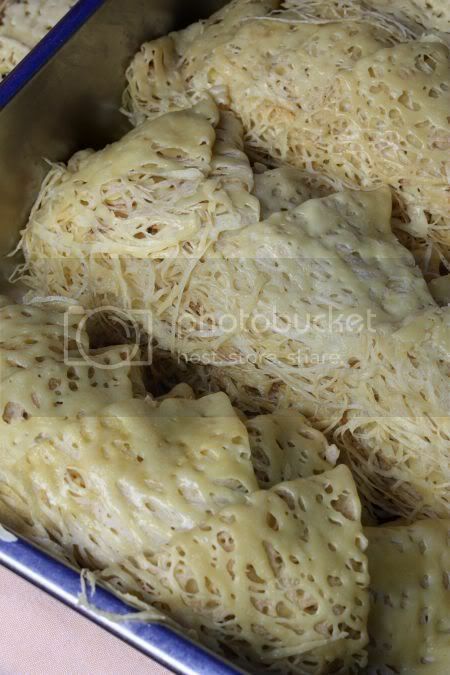 Add to the roti jala and then fold and you get the new, "rojabak". For detailed pictures, refer to my flickr set. Tastewise, not bad but needs some curry or chili sauce to go with it. 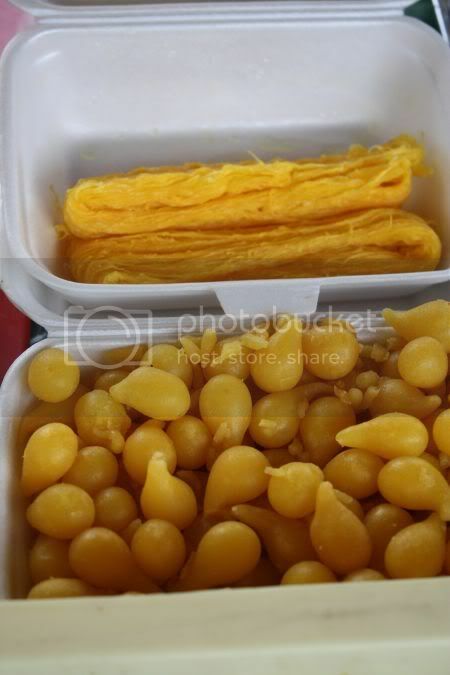 If you prefer, the original roti jala is also available - not the extra crisp version but the softer one, that I like. For the 2007 and previous years, click on this link.